Fulk V, Count of Anjou – King of Jerusalem – Knights Templar – father of Baldwin lll and Amalric l Kings of Jerusalem, father of Geoffrey V Count of Anjou ( Plantagenet ) Consort of England – and Grandfather of Henry ll King of England. As his title above suggests, Fulk V was a major historical figure who is quite often overlooked today, primarily due to a number of life events that surrounded his more famous family, these very events would ultimately create a huge change in the path of the English royal dynasties and certainly history. These events have even overshadowed his own importance in history, and his individual achievements, but certainly have not diminished his enormous legacy. He is often the forgotten father of Geoffrey (Plantagent) V Count of Anjou, Consort of England, and he was also the paternal grandfather of Henry ll King of England. Firstly Fulk’s daughter Isabela (strangely also known as Alice or Matilda ) married William Adelin, son of Henry l and heir to the throne of England, William Adelin later died in the White Ship disaster. Secondly Fulk’s son Geoffrey V of Anjou (later nicknamed Plantagenet) married Henry l daughter Matilda (Empress Matilda ) now heir to the English throne, but being female and married to an Angevin, historical enemies of the ruling Norman dynasty, she was never to be crowned Queen. Her cousin Stephen of Blois another Frenchman and grandson of William the Conqueror had assumed the English thrown. A bitter civil war between Matilda and King Stephen ensued for another 15 years. Finally a treaty between King Stephen between Geoffrey V and Empress Matilda would later see their son Henry become the rightful heir, and become, Henry ll King of England in 1154 and the “Plantagenet Dynasty” of Kings was founded and would continue ruling England and its empire for a further 350 years. It is interesting to note that had Fulk’s son in law William Adelin , not died in tragic circumstances , His daughter Isabela would have been Queen of England and Fulk’s genetic legacy would have been in the hands of the Norman Dynasty. In the end, by a twist of fate, Fulk’s legacy extended a lot further than most people would like to admit even to this day. The Angevin empire he had fortified had taken over England in the form of the mighty Plantagenets. William the Conqueror would not have been happy seeing in less than 90 years of Norman dynastic rule all his hard work eventually handed to an Angevin. Fulk V a Knights Templar and the King of Jerusalem from 1131, died in 1143. In his lifetime, he had become a very powerful Lord, engineered some very fruitful marriages his own included, and enlarged the Angevin empire and served wholeheartedly in the Crusades as Knights Templar and as King of Jerusalem. Unfortunately he did not live long enough to see his grandson Henry’s coronation in 1154 or the amazing legacy that he left behind. I am sure he would have been a very proud old man. Fulk (in French) Foulque or Foulques; Born. about 1089/1092 place Unknown – Died. 13 November 1143 Acre), also known as Fulk the Younger, was Count of Anjou (as Fulk V) from 1109 to 1129, and King of Jerusalem from 1131 to his death. 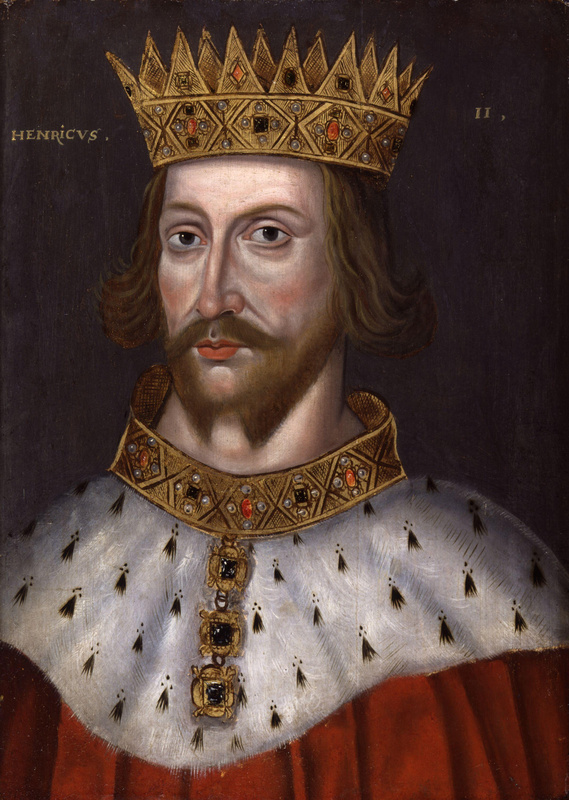 He was also the paternal grandfather of Henry II of England. He became count of Anjou upon his father’s death in 1109. In the next year, he married Erembourg of Maine, cementing Angevin control over the County of Maine. He was originally an opponent of King Henry I of England and a supporter of King Louis VI of France, but in 1118 or 1119 he had allied with Henry when Henry arranged for his son and heir William Adelin to marry Fulk’s daughter Matilda. Fulk went on crusade in 1119 or 1120, and became attached to the Knights Templar. (Orderic Vitalis) He returned, late in 1121, after which he began to subsidize the Templars, maintaining two knights in the Holy Land for a year. Much later, Henry arranged for his daughter Matilda to marry Fulk’s son Geoffrey of Anjou, which she did in 1127 or 1128. By 1127 Fulk was preparing to return to Anjou when he received an embassy from King Baldwin II of Jerusalem. Baldwin II had no male heirs but had already designated his daughter Melisende to succeed him. Baldwin II wanted to safeguard his daughter’s inheritance by marrying her to a powerful lord. Fulk was a wealthy crusader and experienced military commander, and a widower. His experience in the field would prove invaluable in a frontier state always in the grip of war. However, Fulk held out for better terms than mere consort of the Queen; he wanted to be king alongside Melisende. Baldwin II, reflecting on Fulk’s fortune and military exploits, acquiesced. 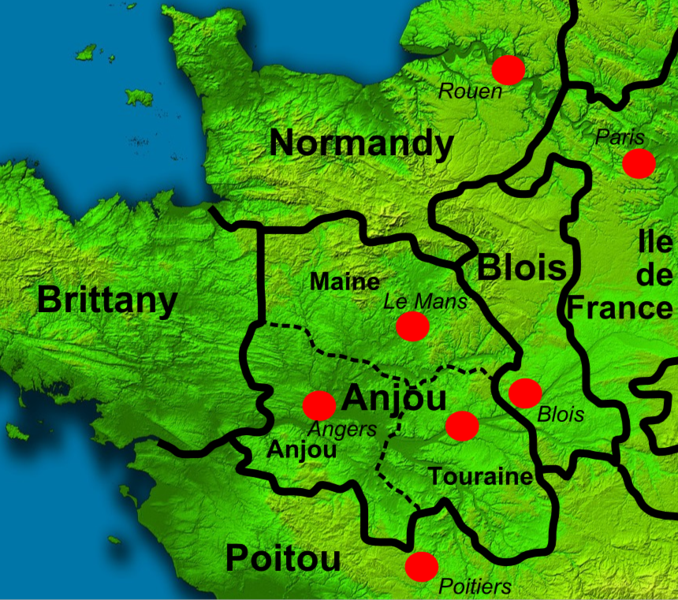 Fulk abdicated his county seat of Anjou to his son Geoffrey and left for Jerusalem, where he married Melisende on 2 June 1129. Later Baldwin II bolstered Melisende’s position in the kingdom by making her sole guardian of her son by Fulk, Baldwin III, born in 1130. Fulk and Melisende became joint rulers of Jerusalem in 1131 with Baldwin II’s death. From the start Fulk assumed sole control of the government, excluding Melisende altogether. He favored fellow countrymen from Anjou to the native nobility. The other crusader states to the north feared that Fulk would attempt to impose the suzerainty of Jerusalem over them, as Baldwin II had done; but as Fulk was far less powerful than his deceased father-in-law, the northern states rejected his authority. Melisende’s sister Alice of Antioch, exiled from the Principality by Baldwin II, took control of Antioch once more after the death of her father. She allied with Pons of Tripoli and Joscelin II of Edessa to prevent Fulk from marching north in 1132; Fulk and Pons fought a brief battle before peace was made and Alice was exiled again. In Jerusalem as well, Fulk was resented by the second generation of Jerusalem Christians who had grown up there since the First Crusade. These “natives” focused on Melisende’s cousin, the popular Hugh II of Le Puiset, count of Jaffa, who was devotedly loyal to the Queen. Fulk saw Hugh as a rival, and it did not help matters when Hugh’s own stepson accused him of disloyalty. In 1134, in order to expose Hugh, Fulk accused him of infidelity with Melisende. Hugh rebelled in protest. Hugh secured himself to Jaffa, and allied himself with the Muslims of Ascalon. He was able to defeat the army set against him by Fulk, but this situation could not hold. The Patriarch interceded in the conflict, perhaps at the behest of Melisende. Fulk agreed to peace and Hugh was exiled from the kingdom for three years, a lenient sentence. However, an assassination attempt was made against Hugh. Fulk, or his supporters, were commonly believed responsible, though direct proof never surfaced. The scandal was all that was needed for the queen’s party to take over the government in what amounted to a palace coup. Author and historian Bernard Hamilton wrote that the Fulk’s supporters “went in terror of their lives” in the palace. Contemporary author and historian William of Tyre wrote of Fulk “he never attempted to take the initiative, even in trivial matters, without (Melisende’s) consent”. The result was that Melisende held direct and unquestioned control over the government from 1136 onwards. Sometime before 1136 Fulk reconciled with his wife, and a second son, Amalric was born. Jerusalem’s northern border was of great concern. Fulk had been appointed regent of the Principality of Antioch by Baldwin II. As regent he had Raymund of Poitou marry the infant Constance of Antioch, daughter of Bohemund II and Alice of Antioch, and niece to Melisende. However, the greatest concern during Fulk’s reign was the rise of Atabeg Zengi of Mosul. In 1137 Fulk was defeated in battle near Baarin but allied with Mu’in ad-Din Unur, the vizier of Damascus. Damascus was also threatened by Zengi. Fulk captured the fort of Banias, to the north of Lake Tiberias and thus secured the northern frontier. Fulk also strengthened the kingdom’s southern border. His butler Paganus built the fortress of Kerak to the south of the Dead Sea, and to help give the kingdom access to the Red Sea, Fulk had Blanche Garde, Ibelin, and other forts built in the south-west to overpower the Egyptian fortress at Ascalon. This city was a base from which the Egyptian Fatimids launched frequent raids on the Kingdom of Jerusalem and Fulk sought to neutralise this threat. In 1137 and 1142, Byzantine emperor John II Comnenus arrived in Syria attempting to impose Byzantine control over the crusader states. John’s intention of making a pilgrimage, accompanied by his impressive army, to Jerusalem alarmed Fulk, who wrote to John pointing out that his kingdom was poor and could not support the passage of a large army. This lukewarm response dissuaded John from carrying through his intention, and he postponed his pilgrimage. John died before he could make good his proposed journey to Jerusalem. In 1143, while the king and queen were on holiday in Acre, Fulk was killed in a hunting accident. His horse stumbled, fell, and Fulk’s skull was crushed by the saddle, “and his brains gushed forth from both ears and nostrils”, as William of Tyre describes. He was carried back to Acre, where he lay unconscious for three days before he died. He was buried in the Church of the Holy Sepulchre in Jerusalem. Though their marriage started in conflict, Melisende mourned for him privately as well as publicly. Fulk was survived by his son Geoffrey of Anjou by his first wife, and Baldwin III and Amalric I by Melisende. According to William, Fulk was “a ruddy man, like David… faithful and gentle, affable and kind… an experienced warrior full of patience and wisdom in military affairs.” His chief fault was an inability to remember names and faces. William of Tyre described Fulk as a capable soldier and able politician, but observed that Fulk did not adequately attend to the defense of the crusader states to the north. Ibn al-Qalanisi (who calls him al-Kund Anjur, an Arabic rendering of “Count of Anjou”) says that “he was not sound in his judgment nor was he successful in his administration.” The Zengids continued their march on the crusader states, culminating in the fall of the County of Edessa in 1144, which led to the Second Crusade (see Siege of Edessa). Alice (or Isabella) (1111–1154, Fontevrault), married William Adelin; after his death in the White Ship she became a nun and later Abbess of Fontevrault. I too, am a part of this family line of ancestry.So interesting! My maternal Grandfather was a Faulkhead which was changed only when his Granfather came to Australia from England. Back there he was a Folkard, so possibly a spelling glutch on a ship’s manifest?